Real Madrid enjoyed less than a third of possession against Real Betis, but still managed to emerge from a tight La Liga encounter with three points. Santi Solari’s team led for much of the contest, after Luka Modric hammered in a fine opener on 13 minutes. When the ball-hungry Betis midfield finally engineered an equaliser for former Madrid player Sergio Canales midway through the second half, it looked as though the Champions League winners might lose even more ground on Barcelona at the top of La Liga – but substitute Dani Ceballos stepped up to fire home a free-kick with only moments remaining. Madrid are now fourth in the table, 10 points behind Barca; Betis, now without a win in three, are seventh. 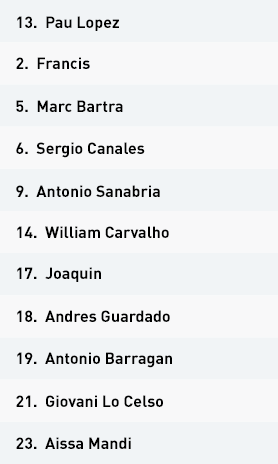 Real Betis set up in a 4-3-3 shape in possession, with William Carvalho, Andres Guardado and Giovani Lo Celso as the midfield trio behind a front three of Sergio Canales, Antonio Sanabria and Joaquin. Quique Setien’s men looked to dominate the ball in a possession-based style, but the story of the game can be summed up with two simple statistics: 68 per cent possession, two shots on target. Betis almost trebled the amount of passes that Real Madrid completed, but the hosts found penetrating their opponents’ defensive unit a real struggle throughout. They tried to create opportunities by playing through Madrid’s initial high press, creating free men between the lines by overloading Madrid’s central pairing of Casemiro and Fede Valverde with William, Lo Celso and Guardado. 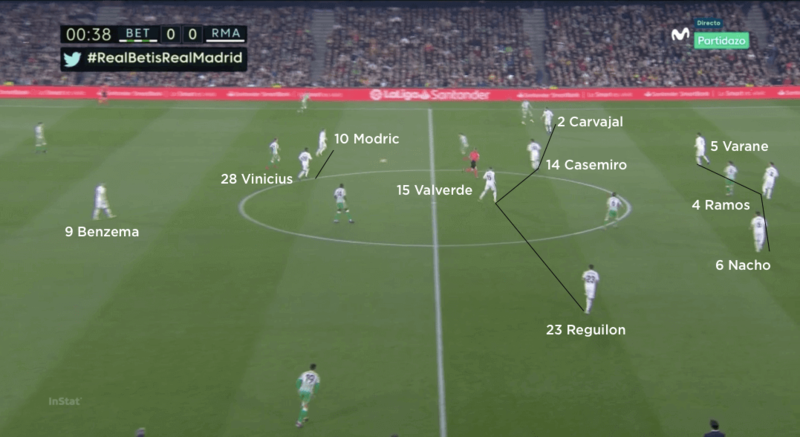 When Madrid matched the Betis midfield, usually by dropping Luka Modric or Vinicius in to track the third midfielder, Betis would themselves drop Canales or Sanabria into midfield, where the Madrid central defenders were reluctant to follow. 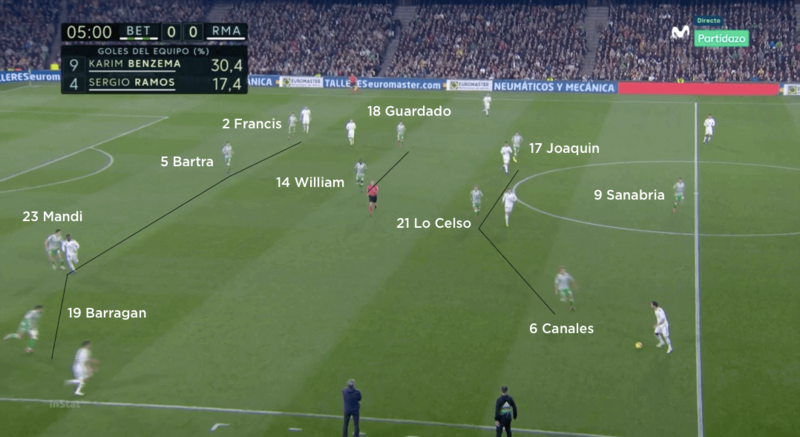 The hosts had a significant amount of possession in the Madrid half, but the majority was circulated in front of the extremely compact low block Madrid formed whenever Betis had good possession. 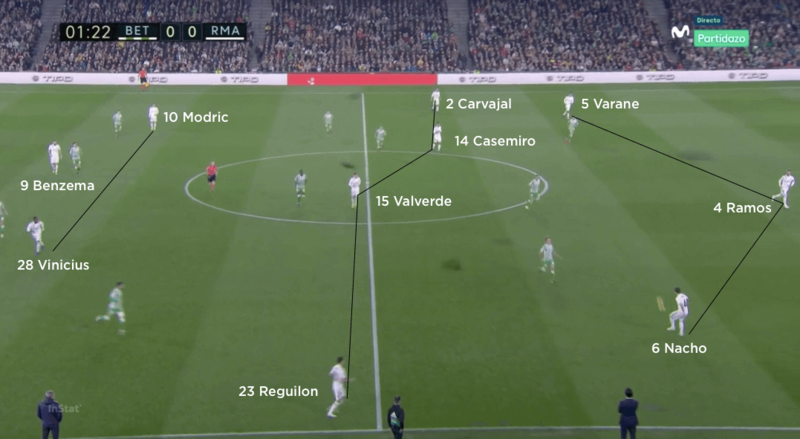 Betis tended to push the front three inside more and use their full-backs to provide the width, essentially pulling Madrid into a 5-3-2 formation with Dani Carvajal and Sergio Reguilon tracking the full-backs all the way back. As a result, the hosts used switches of play to try to unbalance the Madrid block and take advantage on the weak side. 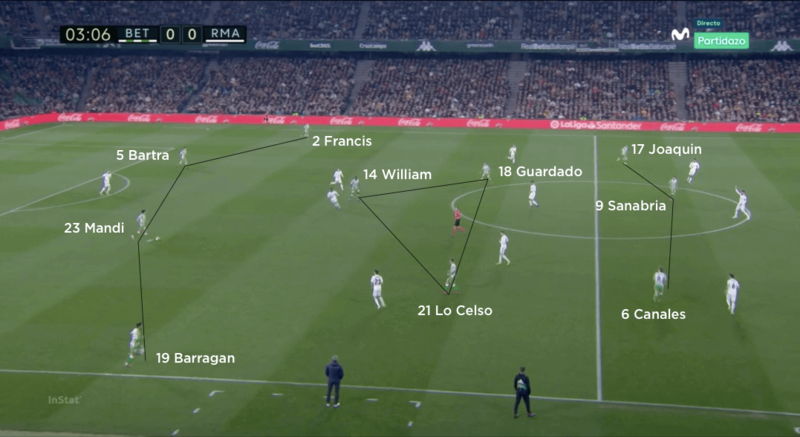 They overloaded these areas with full-back, wide attacker and one of the midfield three – usually Guardado, and never William – but the switches were mostly too slow, enabling Madrid to shuffle across and deal with the threat comfortably. 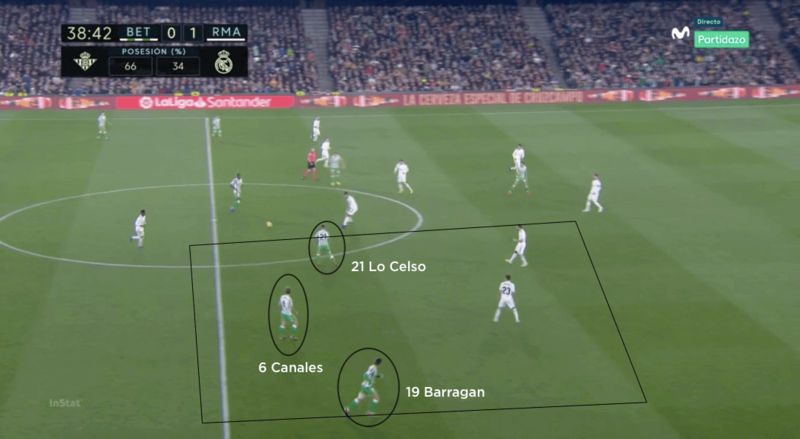 Out of possession, Betis looked to press in a 4-3-3 or 4-2-3-1, depending on the positioning of Valverde and Casemiro, and thus how Lo Celso and Guardado chose to track them. 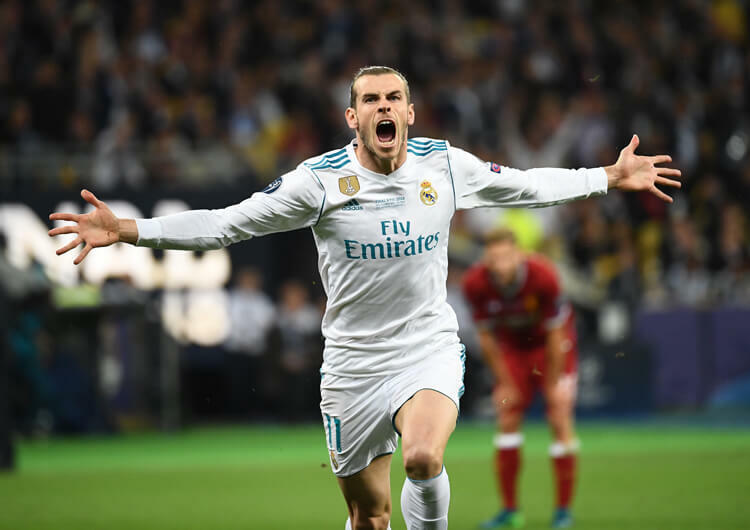 The home side looked to press Madrid aggressively and high up the pitch, but with Madrid having so little time on the ball – and playing direct and early when they did – their pressing structure was rarely required. Instead, the majority of Betis’ defending came through recovery runs as Madrid looked to hit them on the counter. These recoveries would show the ball-carrier away from the centre of the pitch, looking to delay the next action as long as possible so more players could recover. They also looked to initiate an immediate counter-press upon losing possession, positioning players near the ball when in possession so they could exert heavy and immediate pressure as soon as possession was lost. Real Betis set up in a 4-3-3 formation, with Sergio Canales, Antonio Sanabria and Joaquin leading the line. 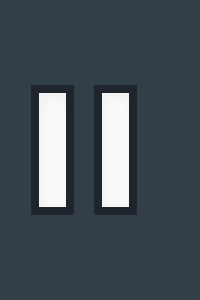 The hosts pressed in the same 4-3-3 formation, although it sometimes resembled the 4-2-3-1 pictured here, depending on the positioning of the Real Madrid midfielders. 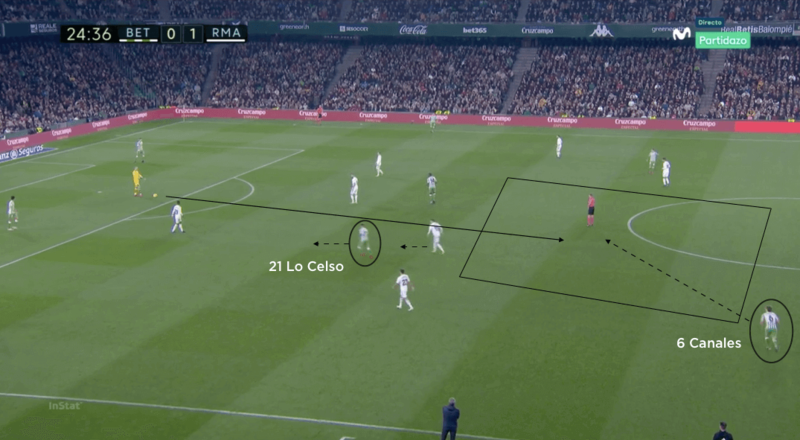 The movement of the Betis midfielders, here Giovani Lo Celso, would be aimed at creating passing lines into midfield and eliminating Madrid’s high lines of pressure. Betis looked to overload wide areas as they were switching play, but they rarely switched quickly enough to trouble the Madrid defence. Real Madrid used a 3-4-2-1 formation in possession, with Luka Modric and Vinicius Junior supporting Karim Benzema in attack. The visitors enjoyed only 32 per cent of possession, so naturally looked to the counter-attack as their main form of offence. They pressed in the same 3-4-2-1 formation when they tried to disrupt Betis’ build further up the pitch. In order to commit more players higher up the pitch, Madrid were happy to leave their defensive line three on three against the Betis attackers. The visitors also used a 5-3-2 low block, with high vertical and horizontal compactness. The one time Real’s defensive shape lapsed, Betis scored. Fede Valverde stepped out to press William, which in turn drew Sergio Ramos out to press the freed Lo Celso – the latter could then exploit the space in behind to find goalscorer Canales. 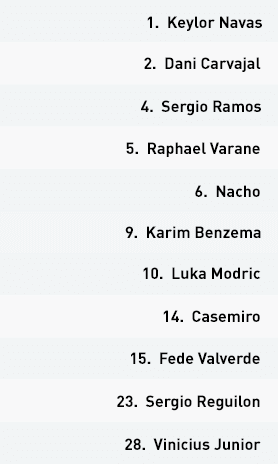 Real Madrid set up in a 3-4-2-1 formation, with Sergio Ramos, Nacho and Raphael Varane forming the back three. 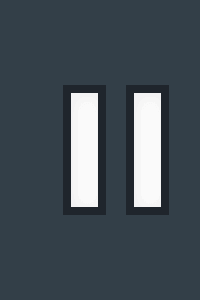 Dani Carvajal, Casemiro, Fede Valverde and Sergio Reguilon operated across midfield, with Luka Modric and Vinicius Junior supporting lone forward Karim Benzema.  Madrid played several direct passes early on, looking to release Vinicius and Benzema in behind the Betis back line – but these were largely unsuccessful and Madrid rarely maintained possession from such situations. The visitors managed only 32 per cent possession, and mainly looked to hit Betis on the counter-attack, as they did in the move that eventually led to Modric opening the scoring. 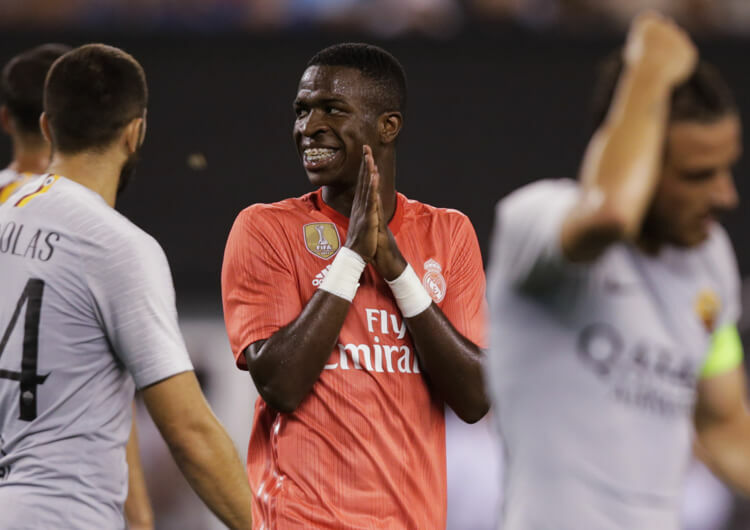 They would often keep Vinicius high in their out-of-possession phases, so that upon regain they could release him in behind the Betis defence as early as possible. Additionally, with wing-backs Carvajal and Reguilon pushing high to provide width, Madrid were able to use Modric in more central areas, where he is generally at his most dangerous. Out of possession, Madrid switched between a high press and an extremely compact mid-low block. The high press took on the form of a 3-4-2-1, while the low block was in a 5-3-2. 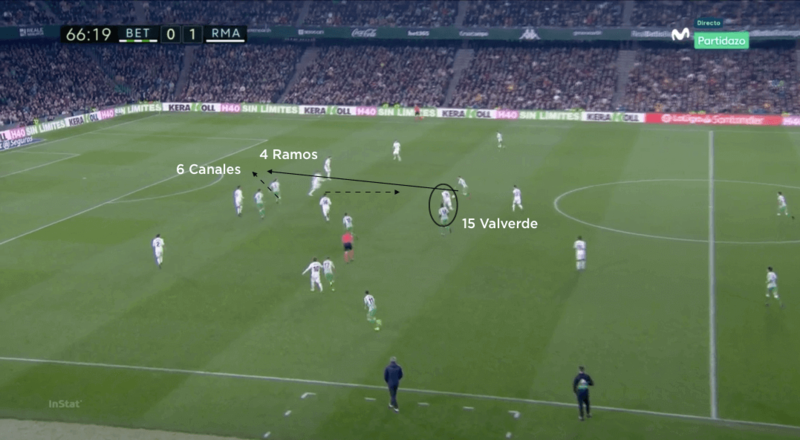 When pressing high, Madrid took the risk of leaving three against three – Ramos, Nacho and Varane against Joaquin, Sanabria and Canales – at the back in order to commit more players forward and disrupt the Betis build. Benzema would look to show the Betis centre-back in possession towards one side of the pitch. The wing-back on that side would press the Betis full-back, Vinicius and Modric would look to occupy William, and Casemiro and Valverde would track Guardado and Lo Celso – although when they wanted a free man in midfield to screen the ball into the Betis forwards, the far-side wing-back would step in to cover his man. 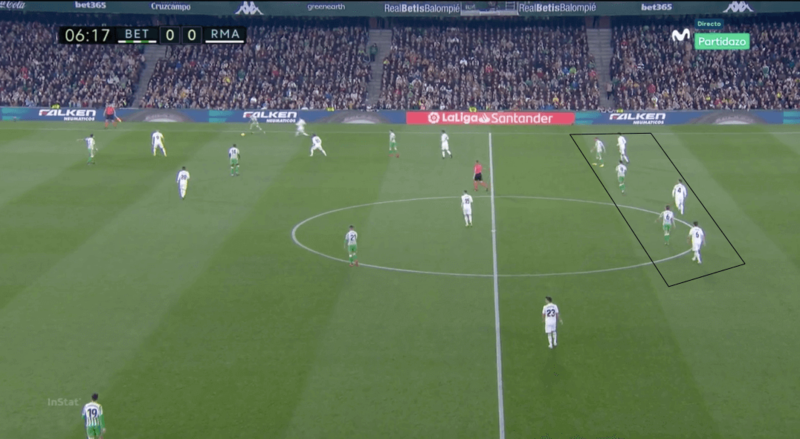 When Betis had good possession of the ball, Madrid would retreat into a 5-3-2 low block and maintain extreme central compactness, both horizontally and vertically. 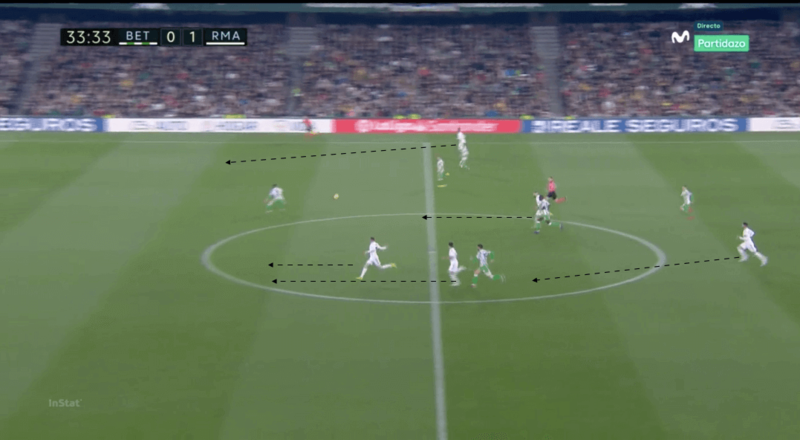 This minimised the Betis forwards’ ability to receive between the lines; as soon as the ball was played into them, there would be pressure from both front and back. The centre-backs would drop with their runners in the low block, while Modric and Valverde pressed in wide areas, which allowed Carvajal and Reguilon to stay compact alongside the back three. Madrid were happy for Betis to build in wide areas, because any crosses into the box could be dealt with by Ramos, Nacho and Varane, with Casemiro, Valverde and Modric available to pick up any second balls. This approach required high levels of concentration, and Betis punished Madrid on the one occasion when these levels dropped. Valverde moved out of his slot to press William, which created a passing line to Lo Celso; as a result, Ramos left his defensive slot to shut down the midfielder, who found Canales free to fire home from the space the Madrid captain has just vacated. Fortunately for the visitors, this error didn’t cost them the three points, as substitute Dani Ceballos struck the winner direct from a free-kick only moments from full-time to move the Champions League holders into the top four in La Liga.